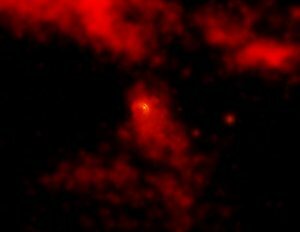 Pulsar wind in the Vela Nebula. Credit: CXC, SAO, NASA. A pulsar wind nebula is a characteristic form, consisting of a bull's-eye ring pattern and escaping jets, that is taken by radiation and particles flowing away from some rapidly spinning neutron stars at the heart of supernova remnants (SNRs). The magnetic fields around the pulsar accelerate the particles, forming jets in the vicinity of the poles of the collapsed star and a ring flowing away from the pulsar's equatorial region. Pulsar wind nebulae have been observed in the X-ray region by the Chandra X-ray Observatory around several young SNRs, including the Crab Nebula, the Vela supernova remnant, and SNR G54.01+0.3.